Astra 2E is drifting eastwards this week, as the satellite moves to fill the orbital postion previously occupied by Eutelsat 28A. The satellite carries many of the UK's main TV and radio services from broadcasters including the BBC, ITV and Channel 4, as well as Ireland's RTÉ. By the beginning of August, Astra 2E will have moved from 28.35 degrees East to 28.5 degrees East. It's a marginal adjustment that shouldn't affect viewers within the UK and Ireland at all. 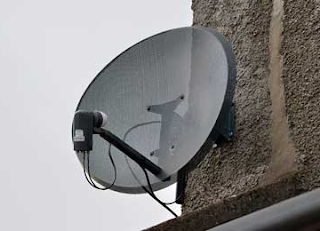 This is because most satellite dish installations were done with dual reception from 28.2 and 28.5 degrees East in mind, with the dish often pointing at a sweet spot to get the best signal from all satellites carrying Sky and Freesat channels. 28.5 degrees East was used until the end of last month by Eutelsat. Astra 2E produces a much stronger signal across the British Isles than Eutelsat 28A did. Outside of the official footprint of Astra 2E, and where very large dishes are required slight adjustments may be required. 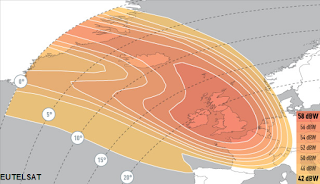 The satellite's spotbeam will continue to be focused on the UK and Ireland despite the move, so viewers shouldn't expect the coverage area to change dramatically. The outer rim of the pictured spotbeam is where 130-150cm dishes are typically required for a stable signal. Astra 2F and G remain close to 28.2 degrees East. last checked 28/07/2015. Many smaller channels frequently change frequencies, so the information shown here is liable to become out-of-date beyond 1 month of the publication date.